I flew with SA Express from Durban to Cape Town, and my flight was provided by South African Tourism (Australia) as part of an Australian media trip to Durban, South Africa. 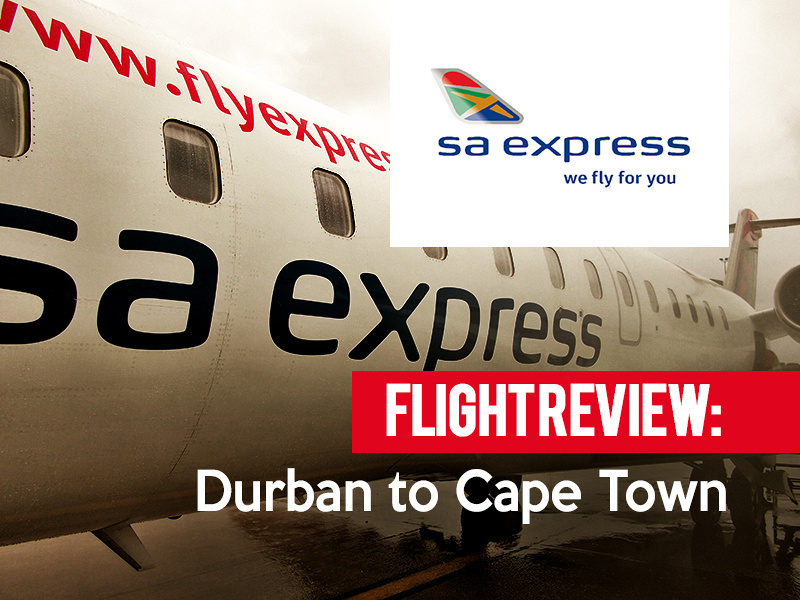 SA Express (or also South African Express) is affiliated with South African Airways but it is operated independently of it. Both airline brands are owned by the South African government. After reading about the airline and flying with them I’m still confused as to why there needs to be a separate airline. My previous flight was with SAA from Joburg to Durban which felt like flying the same airline. It turns out that I was lucky with my timing because the airline had its operating licence revoked just the week before. They are also running at a loss, which makes me double wonder why they would run a separate brand from SAA, and all the duplication of expenses that this system entails. Anyway, this is not an aviation policy blog but a flight review. Fortunately I had not read any local news in the previous week and didn’t know about this. 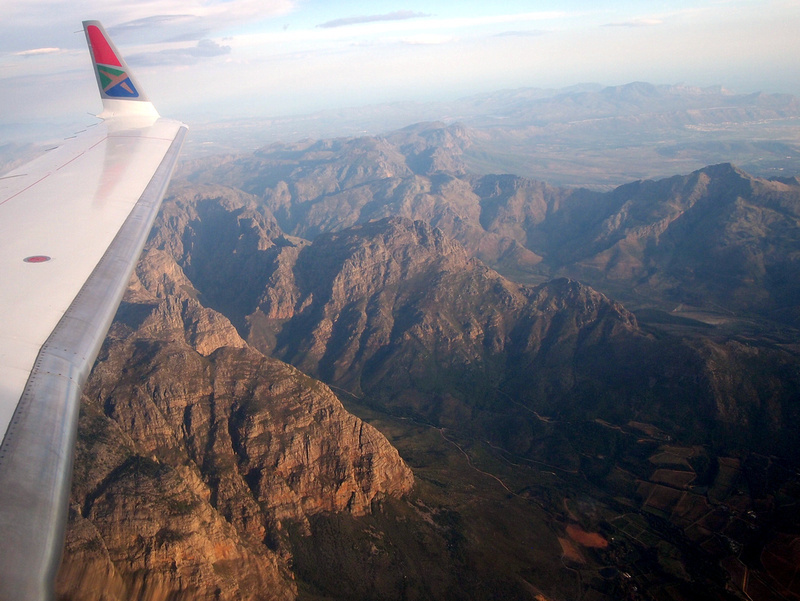 The flight from Durban to Cape Town was in a Canadair RJ 200. It’s been years since I have flown in a regional jet I was looking forward to flying in a different aircraft type other than an A320/737, which low cost airlines around the world prefer. 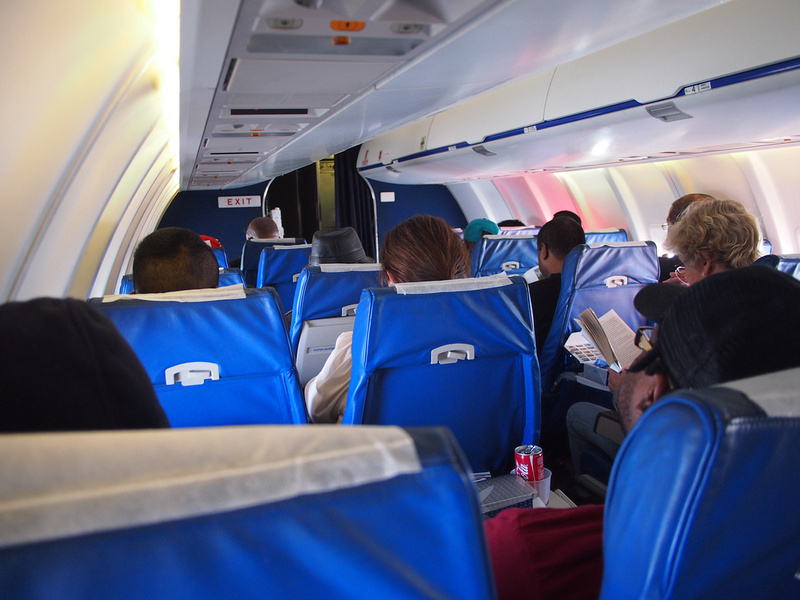 The cabin space is tight in these jets so big carry-on bags are collected and stowed. There are 12 rows with 4 seats across (no middle seats! ), all economy seats. I am 6’1″ and I barely clear the ceiling of the aisle. While the seats are noticeably narrower than an A320/737 they have at least left a good amount of leg room. 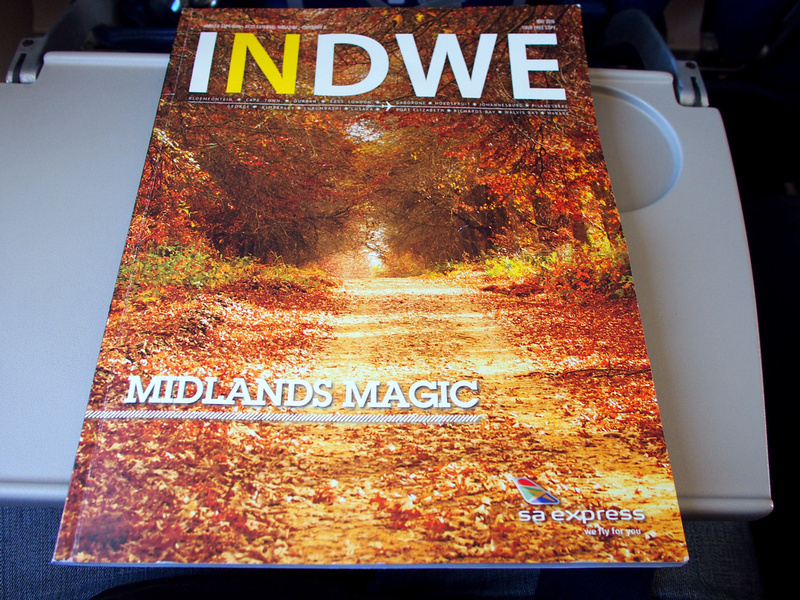 Getting back to the branding, SA Express has its own inflight magazine (Indwe) while SAA prints its own magazine . The flight was at 3pm with 2hours and 15 minutes of scheduled flying time so on this flight a lunch pack was served. 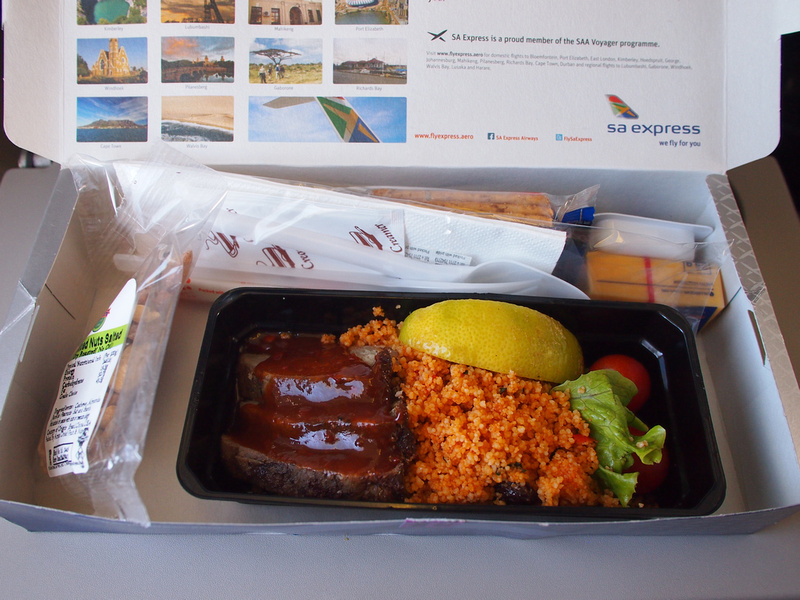 Lunch consisted of cold roast beef and couscous, something I have never had on a flight but it worked very well. I got a coffee, mainly because I could. 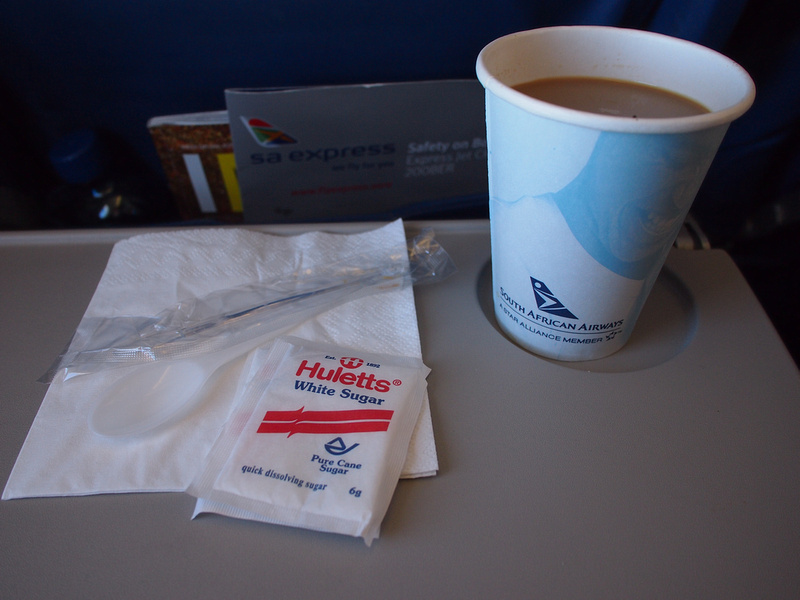 The usual airline fare but at least you get a generous-sized cup here. I got a window seat because I want to see my first glimpse of Cape Town from the air. The scenery was spectacular. Approaching Cape Town airport I could see it in the distance but the angle felt too tight to make a landing. I have become so used to bigger aircraft needing a longer approach that I really noticed the steep descent and tight turn into the landing path. A smaller aircraft also means a tarmac deplaning at Cape Town Airport. Overall a good flight with no complications.